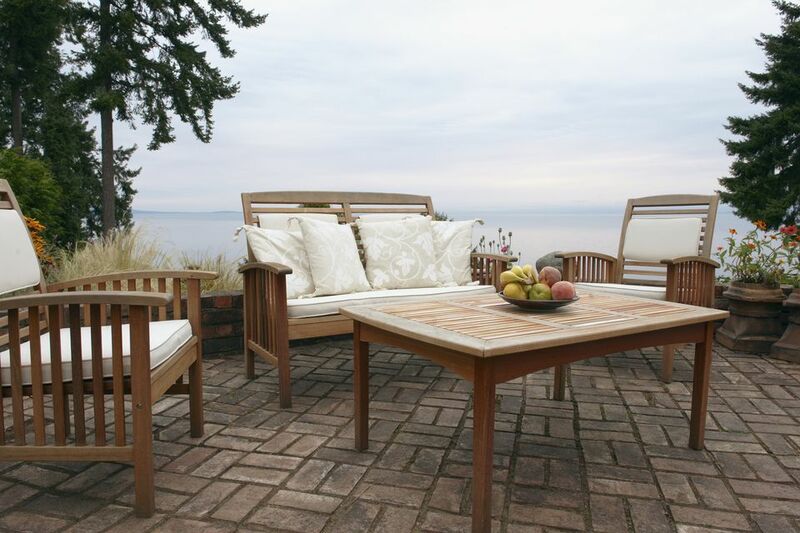 When the cushions and upholstery of your outdoor furniture wear out, your first impulse might be to replace them or have them professionally reupholstered. But this can be surprisingly pricey. So why not do it yourself? You don't need sewing skills, and you can choose from a wide range of indoor/outdoor fabrics in assorted colors, prints, and solids at any well-stocked online or local fabric retailer. 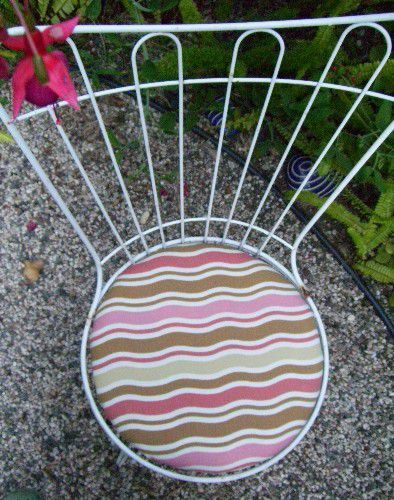 Doing your own reupholstery is also a great way to restore vintage garden chairs and other salvaged patio furniture without turning it into an expensive project. Remove the chair seat base or pad from the chair frame. Use a red or black non-smearing marker to trace the shape of the seat onto a large piece of paper to create a simple pattern. This can be newspaper, butcher paper, or pieces of printer paper taped together. Cut out the paper pattern with scissors. Keep in mind that you'll need extra fabric to cover the chair seat, to account for wrapping the fabric over the edges and onto the bottom of the seat, where you will secure the fabric with staples. In general, you should plan to add about 3 inches all around onto your pattern. Take the paper pattern with you to the fabric store, or shop online, and choose an indoor/outdoor fabric that will accommodate the pattern plus several inches all around. Most fabric stores have a special section for indoor/outdoor fabrics (often in a home decor area). These fabrics usually come in bolts that are 54 inches wide. Some stores carry large swatches or samples of outdoor fabric that can be ordered. It is usually grouped by color, brand, or manufacturer. If you're on a budget, look for fabric off-season, such as after summer or before spring. Lay out the fabric, wrong side up, on a table or flat surface so it is smooth and wrinkle-free. Place the pattern over the fabric (preferably in a corner, to conserve as much material as possible). Use a pencil to trace around the pattern, adding a margin of 3 inches (or as needed) for wrapping the fabric around the chair seat. Cut out the fabric with good, sharp fabric scissors. Place the chair seat upside down and pull out all of the staples securing the old fabric. You can use a staple removal tool, if you have one; otherwise, use a thin flat-head screwdriver and pliers. Remove the old fabric from the seat. Place the chair seat upside down onto the wrong side of the fabric cutout so the seat is centered on the fabric. Pull the fabric over the edge of the seat and staple it to the backside of the seat, using a staple gun. Continue around the seat, stapling the fabric every 1 to 2 inches. It's OK if the fabric overlaps on this side, where you are stapling. Just make sure that the material doesn't crease, dimple or overlap on the right side (top side) of the seat. Check frequently to see how the fabric looks on the right side of the pad. Flip over the chair pad to inspect the finished upholstery. If it isn't completely smooth—maybe a crease or overlapping fabric here and there—you can always remove the staples, smooth out the fabric, and re-staple. Fit the seat onto the chair frame. If there are any screws or other fasteners that hold the seat in place, add those now, or install new hardware.